All images and texts with the exception of comments and images posted by others are the property of Justin Wonnacott. All of the rights to reproduce these images and texts in any form or for any type of public presentation belong to the artist, photographer and author Justin Wonnacott. Entomologist for a day . . .
the aregeebee website door - just click on a dot to enter . . .
Linda's electric bike . . . In the fall or winter there are extended periods of overcast weather when the solar panels do not work. If the storage cells for the electrical supply in the house become badly depleted the batteries can be damaged. This modified bicycle is an alternator/generator that she plugs into the system to keep the batteries charged so that the cells do not become too deeply discharged - good exercise too. Linda's wonderful house . . .
A couple of nights ago Judy and I stayed with a friend who moved away from Ottawa last year. We are very grateful to have been guests in this wonderful, funky place and to have a visit with her. Linda Archibald has a remarkable home south of Killaloe Station, and it is no trapper's shack. It is a livable and comfortable two story log house built to have a low impact on the environment and to be as much "off grid " as is practical for her. The logs are recycled, the electricity comes from her solar panel and battery system, she has her own deep well with a solar powered pump, a composting toilet, a wood stove and gas for cooking and light. Her telephone is a standard land line which gives her the internet connection she needs to work from here. Mabel on stage again . . . 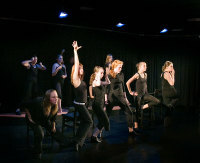 The Ottawa School of Speech and Drama had their performance today of the new musical theatre work "A funny thing happened on the way to the gallery" . This work was written by the players themselves and used many popular tunes within it including hits from "Chicago, "Grease " , "Cabaret" and "Annie Get your Gun", amongst others. Mabel and I visited Toronto and did the kinds of things tourists do. The CN tower was a highlight (groan . . . ) and we took pictures, visited the gift shop and wrote our names 1400 feet above the street below. Canada Day snaps . . . I really love shooting photos of strangers in crowds . I have engaged in this unfashionable lowbrow photographic vice on Canada Day every year since moving to Ottawa over 30 years ago. The Canada Day crowd is the biggest one I see on a regular basis and I love being in it. Admittedly, this is a selfish activity and some people feel it is wrong to do. I am photographing others without their permission without consulting my subjects about how they wish to be presented to the world. I do it to please myself - no client or newspaper tells me what to look at, and I do what I want with the images later. I often include these pictures in portfolios where I try out different motifs or ideas as organizing principles to help me understand them better. They are always a way of learning for me, sometimes as proof , sometimes as speculation and experiment - but mostly they just wind up being filed forever. Shooting in public is getting harder to do. The photographer's license to shoot and the uses they can make of their pictures is an issue that is frequently in the public eye and the object of legislation. The ability to authorize the making of these images has become a commercially valuable commodity too. The danger of what can be said by an undisciplined photograph(er) is well understood by even schoolkids today. In an oversensitive (paranoid?) litigious world the act of photographing someone elses face, their business or their house without permission is seen as a potentially hostile act or a theft of something which might be exploited for financial gain or abused if that image is used in ways which might misrepresent the subject. What valuable moment of yours did that nameless photographer in the crowd take away? After all, your face is your property and you have the right to declare it as a commodity in the infinitely expansible universe of saleable copyrights , permissions and granted uses. Beware the beady eye of that photographer on your wallet - never mind your soul. The bad reputation of photographers have as loose cannons - or subversives - who might hurt you by irresponsibly firing images into the lawless cities and communities of the internet is a real problem. There is no doubt that good ideas and images sometimes can develop a life of their own online and that once they have propagated online there is no hope of controlling the use of them. 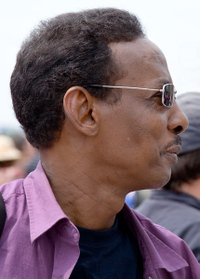 Casual theft of images on the internet, or their redistribution is almost impossible to stop. Paradoxically, this anarchic economy of images has made the value of what a picture is worth plummet in the last decade. Despite that fact that the photographer's skill and the pictures they make are cheaper than ever before, people view the photographer on the street as some kind of ruthless visual treasure hunter who might get something of real value from them. I think people are pretty deluded about what the rights to their images are really worth. The image world is much larger than it was 10 years ago, clip art photography, royalty free images and the explosion of photographers who can photograph anything, anywhere has devalued the material photograph and the price of photographers to the point where good (or useful) pictures are now almost free - or near as dammit . I downloaded a very good hi-res scan of "Migrant Mother" by Dorothea Lange from the Smithsonian for nothing, and I made a beautiful print from it. Of course that picture is worthless except as wallpaper in my office. However, the rights to the commercial use of that image are definitely not free . As an aside, fine art photographs often inhabit an interesting limbo that straddles two different worlds. Many of these pictures are bankable stuff with an established value based on their unique value as scarce collectible objects. The trade in new fine art photograph (or the artwork reproduced as a photograph) without an established market value though is often completely aligned with the modern paradigm based on rights instead of the concrete object . The worth of those images is determined by how much the distribution and reproduction rights can be sold for - not for the ownership of the print. As an argument for a right to photograph in public places fine art photographers have managed some successes . 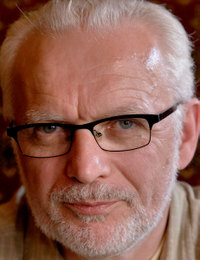 Philip Lorca di Corcia and his "Head Shots"series have had a lot of press lately. He successfully defended his use of, and big prices for sales of images of passers-by in the street he took without their permission. Nonetheless the photographer on the street or in a public place who is seen using a tool that labels them as a photographer at work (not a snapshooting tourist) often attracts the wrong kind of attention. Increasingly it seems to me that photographs that are 'social' in some other form than sentimental memorabilia are legislatively seen with suspicion as potentially corrosive substances to be treated with care. The only good picture is a legal one or at least one that a publication has commissioned. 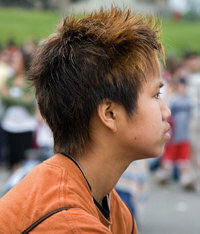 Young man being made up to play Christ in a street performance by a Christian youth group. When I am working in a public place I am often asked "hey buddy . . .why are you taking pictures . . . who are these pictures for anyway . . . ?" and I answer as honestly as I can with as much detail as seems appropriate or necessary. I am really tired of answering that but, If anyone objects, I stop. Parents in particular seem especially vigilant of the angle of view seen by a camera - I have had people walk up to me from half a block away to demand and explanation of what I am doing more than a few times. Sometimes I had not even noticed them because they were so unimportant to the picture. Store owners often cross the street to question me about what I am doing, but I am polite to them too. If they are really sticky, I give them my card, tell them I have work to do and suggest they call the police. Everyday I am photographed by surveillance cameras as I shop, travel on a bus or whenever I am in public places . I accept this, although I know that the "photographer" would be more pompous and rude than I when I ask the same questions my subjects ask me. I would be told something like this: " it is for your own good and the safety of the public" and "No" , if you ask that the photography stop. 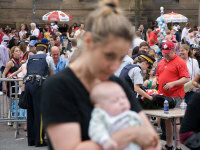 This year all bags and packages carried onto Parliament Hill were searched for the Canada Day party. I was a little frightened to ask why and I did not want to inconvenience anyone you see . . . This is the National Arts Centre Orchestra conducted by NAC musical director P. Zuckerman, and the UNISONG choir seen in performance in the opera at the NAC on July 1. UNISONG is composed of 400 voices made of choirs from every province and 2 Ottawa host choirs.The Unisong choir performed three times on Canada Day to appreciative holiday crowds. My daughter is in the first row of choristers nearest the cellos and basses and she is the seventh singer away from the front of the stage . The Unisong choir was conducted by Stephen Hatfield who is one of Canada's foremost choral arrangers. This is a great event for the audience and for the visiting choirs. My apologies for the off centre shot - I was unable to get to the centre line, so this snap will have to do. This is Gary Hall an acquaintance of mine for 25 years or so. 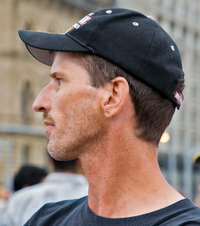 Gary is the director of the Toronto Photographer's Workshop and he has held that position as long as I have known him. We went out for a beer today. 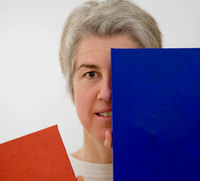 Lorraine Gilbert and painted squares .. .
A funny snap of my friend Lorraine Gilbert holding a couple of coloured canvas squares. Someone I know from a long time ago .. . This is Sandra Semchuk, an artist photographer I have been acquainted with for close to thirty years, I met her in the cafeteria at Emily Carr. I went to see the grad show which was being dismantled when I arrived and asked at the desk if she was in .. . and she was. Ellie has a wonderful garden as does her sister Irene in Ottawa .